Farm sector equity — N.L. 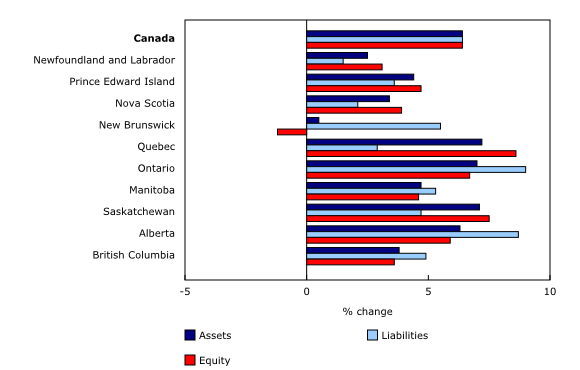 Farm sector equity — P.E.I. Farm sector equity — N.S. 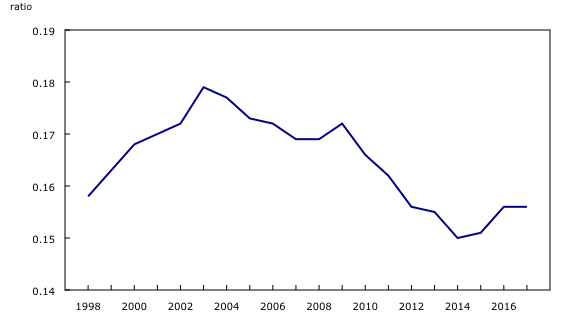 Farm sector equity — N.B. Farm sector equity — Que. Farm sector equity — Ont. Farm sector equity — Man. Farm sector equity — Sask. Farm sector equity — Alta. Farm sector equity — B.C. Canadian farm equity rose by $30.2 billion to $503.9 billion as of December 31, 2017, as the value of assets and liabilities increased at a similar pace—both up 6.4% from 2016. From 2016 to 2017, farm equity rose in every province except New Brunswick (-1.2%), where the growth in liability value outpaced a slight gain in farm asset value. Real estate continued to comprise the majority of farm asset holdings, accounting for three-quarters of the total asset value in 2017. The value of farm real estate rose in every province, up by $30.6 billion nationally from 2016 to $442.4 billion in 2017. The total value of Canadian farm inventories of crops, inputs, poultry and livestock (including breeding livestock) increased 5.1% from 2016 to $47.4 billion in 2017, contributing to higher farm asset values. This was the first increase in inventory value since 2014. The value of crop inventories rose $972.2 million to $19.5 billion. Stocks rose in the wake of record soybean (+17.0%) and canola (+8.8%) production, as well as higher production of wheat excluding durum (+2.6%). Livestock inventory values rose 5.6% from 2016 to $21.6 billion in 2017, as both the values for market (+6.3%) and breeding (+5.2%) livestock increased. These gains were seen throughout the livestock sector and were attributable to higher prices per head, particularly for calves (+5.8%) and beef cows (+4.9%) as cattle prices remained strong in 2017. Total liabilities rose $5.6 billion from 2016 to $92.9 billion in 2017. Despite the first interest rate increases in seven years (in July and September 2017), rates remained relatively low historically while land prices continued to increase in 2017. The interest coverage ratio, which measures the ability of the farm business to service debt (net income before interest and taxes divided by interest expenses), fell 6.4% from 2016 to 4.1 in 2017. However, it remained above the average ratio of the previous 10 years (3.6), indicating an ability to service current debt loads. 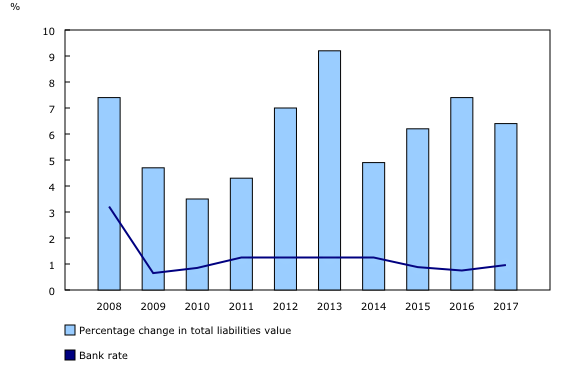 The liabilities-to-asset ratio (15.6%), which indicates the proportion of assets financed through debt, held steady from 2016, and was the fourth lowest ratio in 20 years. The balance sheet of the agricultural sector provides the value of farm assets used to produce agricultural products, the liabilities associated with these assets and the farm sector equity as of December 31 for Canada and the provinces. Assets and liabilities in the agriculture sector's balance sheet include those of farm businesses and non-operator landlords (for farm real estate assets leased to farm operators and the corresponding liabilities) and exclude the personal portion of farm households. This most closely reflects the assets and liabilities used in the production of agricultural products. The balance sheet of the agricultural sector integrates data already produced by Statistics Canada, such as farm debt, value of farm capital, livestock and crop estimates, farm product prices and selected data from the Farm Financial Survey. These data are subject to revision.